Posted byFelipe Adan Lerma	 May 16, 2014 May 17, 2014 Leave a comment on Captioned Photos # 7 – Bike to Work Day! Available by subscription and direct purchase. Wishing everyone a safe Bike to Work Day! I ride the train to my full time temp work a few months each year here in Austin, and am continually impressed by this city’s industrious and determined bicyclers. Everyday I see men and women, all ages, obviously biking the whole way to work, catching buses or the train (Austin only has one train route) part of the way, or combinations of train and bus and road. My son bikes. He says he has to carry a card saying who he is and who to contact if he’s crushed by the side of the road. So my main concern in this post is to both salute the folk willing to bike to work – and wish them all the safe journey possible. I immediately knew, on deciding to do this post, which picture to use. This is an image taken late 2012 when my wife and I were in Paris. It’s across from a laundry we used in our 5 1/2 week stay. Sheila and I remember coming upon the scene well. A brilliant sunny mild autumn day. Highs in the 50s or 60s. What impressed us was that, despite the flat tire, and despite possibly carrying a glass container, both bicycle and container were securely placed for future involvement. 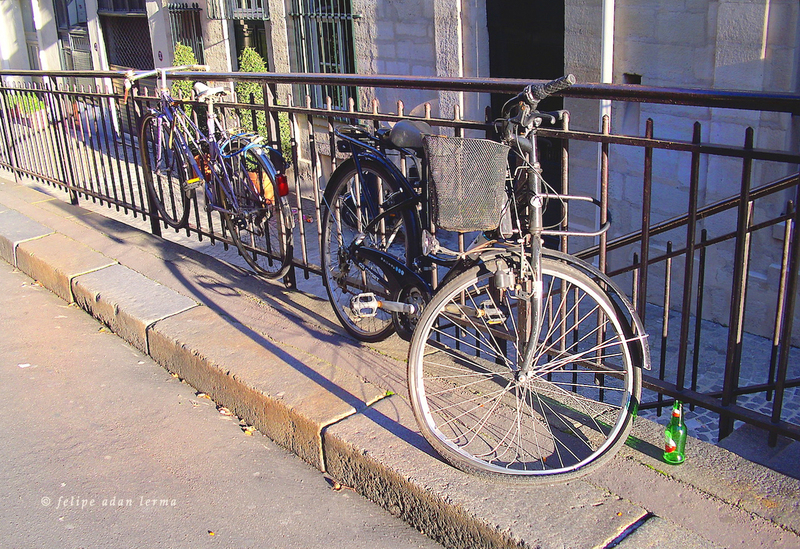 The bicycle, like the one behind it, is securely fastened to the fence. And the glass bottle is not smashed or tumpled, but upright, unbroken. It speaks of conscientiousness and care. To me, that’s a positive image of what a good bicyclist does.